If there’s one fruit that I cannot live without, it’s lemons. And this Meyer Lemon Cake is one lemon recipe that I LOVE. Since I live in New England, and it’s not like there are lemon trees lining my backyard (although I wish there were), I’m that person you see at Costco and Trader Joes with a huge bag of lemons in the cart. So, what exactly do I do will all the lemons? Well, for starters, I drink a glass of lukewarm lemon water every morning. It’s so refreshing, and it’s an excellent source of Vitamin C. And I cook and bake with lemons. A lot. So, you might be wondering where exactly are all the lemon recipes? Honestly, most lemon recipes are eaten before they can be photographed. (Yes, there are tons or recipes I make that never make an appearance here!). But I managed to photograph this gorgeous 4-layer Meyer Lemon Cake before taking it to a friend’s house for dinner. Between each layer of this moist, fluffy cake is the most-lemony Meyer lemon curd. It’s tart, sweet, rich, and it makes the perfect cake filling. 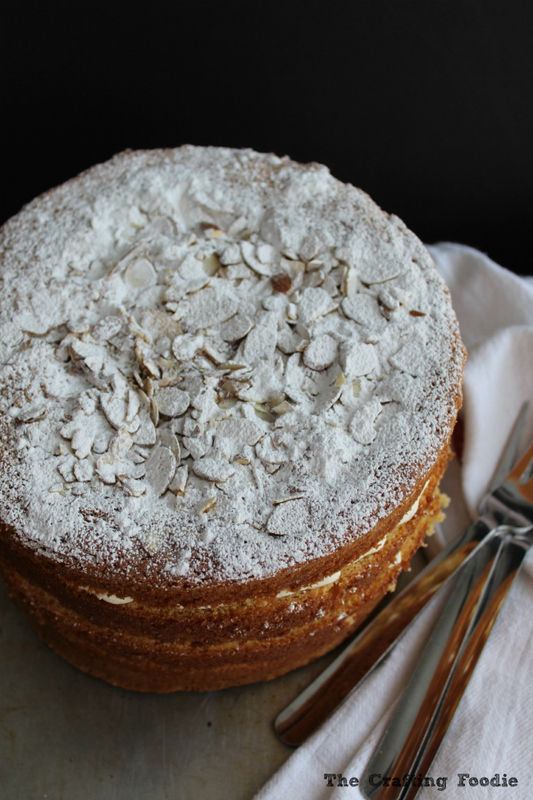 For some crunch, and to make the cake a little more fancy, I topped the Meyer Lemon Cake with some slivered almonds and a generous dusting of powdered sugar. The only frosting on the cake is a thin rim along the edges of each layer. And its only purpose is to keep the Meyer lemon curd from oozing out of the sides of the cake. It also gives the Meyer Lemon Cake a little touch of buttery, sweet richness – just enough to finish the cake with a very small dose of buttercream. While this Meyer Lemon Cake is a towering 4-layers, it’s really quite light since there’s barely any frosting. 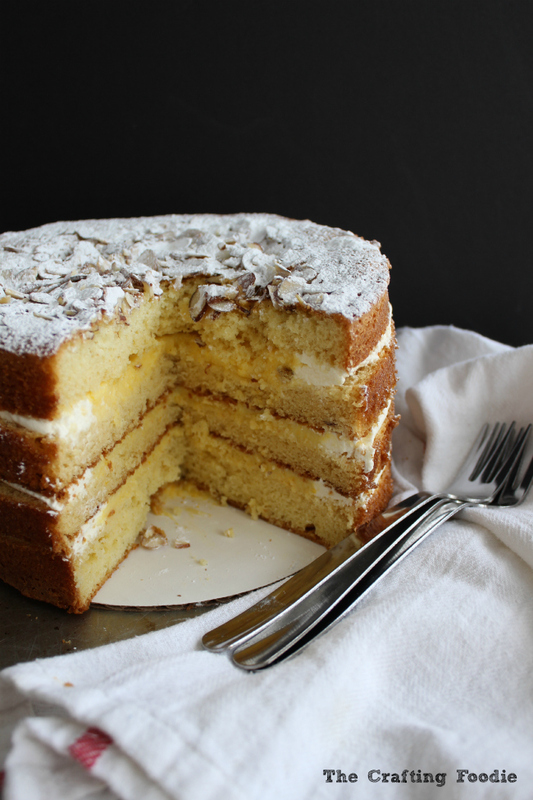 And, the Meyer lemon curd cuts through the fluffy, moist layers of cake. I know my parents would love this cake since they balk at overly-sweet desserts. I have a feeling that the next time I’m home, visiting my family, this cake will be make an appearance! 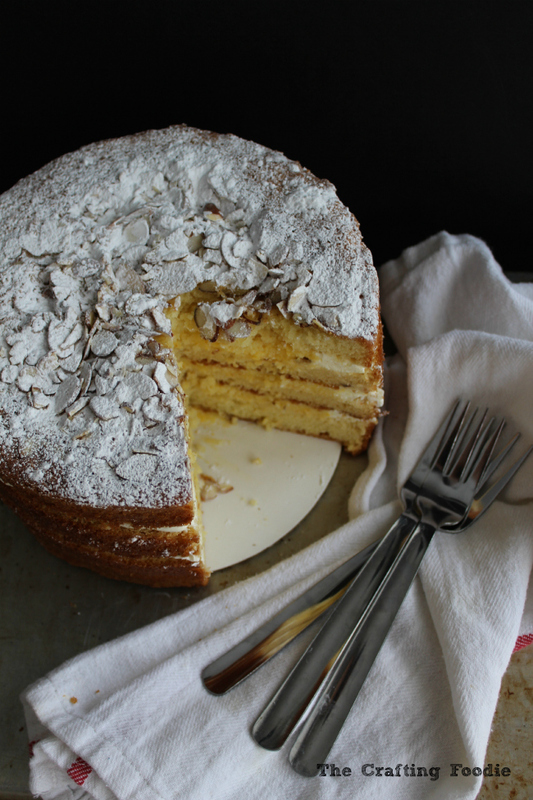 This moist, fluffy lemon cake is filled with fresh lemon curd, and it's topped with slivered almonds and a generous dusting of powdered sugar. For the Meyer Lemon Cake: Grease and line two 8-inch round cake pans with parchment paper. In a medium bowl whisk the flour, baking powder, baking soda, and salt. In another medium bowl, combine the milk, lemon juice, and vanilla. In the bowl of a stand mixer fitted with a whip attachment, whip eggs on medium speed until soft peaks form. Gradually add ¼ cup sugar and continue to whip until stiff peaks form. Transfer the whipped eggs to a separate bowl. In a clean work bowl, beat the butter and remaining sugar with a paddle attachment until light and fluffy. Add the flour mixture in three additions, alternating with the milk mixture. Fold in the whipped egg white. Divide the batter equally between the prepared pans. Sprinkle one of the pans with the slivered almonds. Bake for 25 to 35 minutes until a toothpick inserted in the middle comes out clean, with moist crumbs attached. Turn cakes out on to cooling racks, and allow them to cool completely. While the cakes cool, make the Meyer lemon curd. In a small bowl, using your fingers, rub the zest into the sugar until combined. In a heavy-bottomed sauce pan, whisk the lemon sugar, cornstarch, eggs, egg yolks, and salt together. Add the lemon juice and cook over medium-low heat, whisking constantly, until thickened (it should be the consistency of pudding). It will take 8 to 10 minutes. Once the mixture boils, continue cooking for about 2 minutes longer. Add the butter and stir until it is completely incorporated. Place a piece of plastic wrap over the surface of the curd. Refrigerate until it is completely chilled. While the curd chills, make the frosting. In the bowl of a mixer fitted with a paddle attachment, combine the butter, sugar, and vanilla. Beat until fluffy. To assemble the cake, slice each layer in half, horizontally, creating 4 layers. 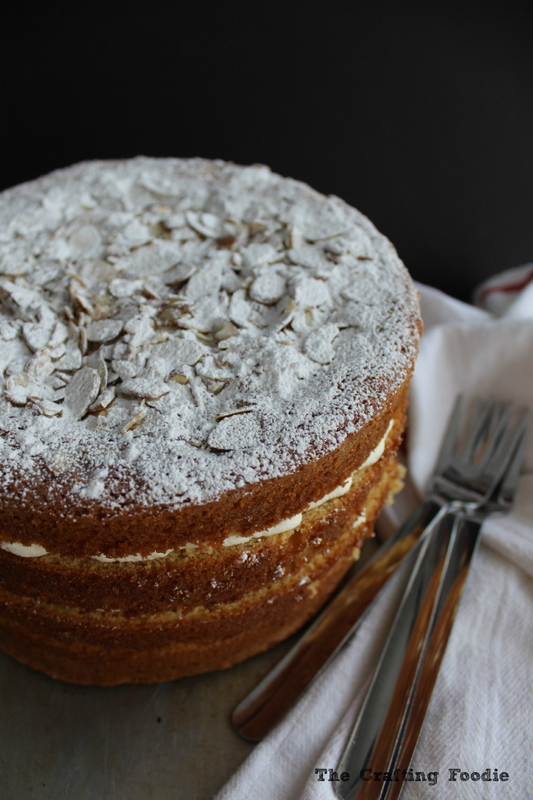 Reserve the layer with the almonds as the top layer. Spread ⅓ of the curd on each layer of the cake. Using a piping bag fitted with a large opening, pipe a rim of the frosting at the edge of each layer. Repeat with the first 3 layers. Place the top layer on the cake. Sift powdered sugar over the top. Absolutely gorgeous! I love how restrained it is, with just that little touch of sweet buttercream. And the almonds sound like such a fabulous addition! I need to use lemons more. You have my mouth watering over that curd filling. Sadly if there’s one food my husband can not stand, it’s lemon. Thank you for sharing on Weekend Bites! I may just make this and indulge with the kids. What a gorgeous cake! I ADORE Meyer Lemons, and would just love a big slice of this cake, right alongside a Lemon Drop Martini! Yum!